Hide this Project (Dreams Elina) Discover properties in other projects by hiding the ones that doesn't interest you. You won't see them in your searches further but you can unhide anytime later. Hide this Dealer (Kale Palave Real Estate)Discover properties by other dealers by hiding those whom you have already spoken to. You won't see them in your searches further but you can unhide anytime later. Hide this Dealer (Deepak Kunjir) Discover properties by other dealers by hiding those whom you have already spoken to. You won't see them in your searches further but you can unhide anytime later. Hide this Dealer (Alpesh) Discover properties by other dealers by hiding those whom you have already spoken to. You won't see them in your searches further but you can unhide anytime later. Hide this Dealer (sanjay jadhav) Discover properties by other dealers by hiding those whom you have already spoken to. You won't see them in your searches further but you can unhide anytime later. Hide this Dealer (Sunny Tambi) Discover properties by other dealers by hiding those whom you have already spoken to. You won't see them in your searches further but you can unhide anytime later. Dreams Elina is a residential project of Dreams Group and Satan Developers and is located in Satav Nagar, Pune. It offers 1, 2 and 3 BHK apartments, which are a true example of intricate designing and construction. The project is well-developed with world-class amenities to provide a luxurious lifestyle to the residents. The buyers can take home loans by several banks such as DHFL, Axis Bank, Bank of Maharashtra, Bank of Baroda and more. Satav Nagar is located in Pune, Maharashtra and is one of the developing localities. It is surrounded by Udyog Nagar, Santoshi Mata Nagar, Mohmmadwadi Ghule and Ganesh Colony. Sasvad Nagar and Sawant Nagar are the nearest bus stations and Phursungi railway station is the closest railway station. The area comprises of well-developed socio-infrastructure and civic amenities to meet the needs of the residents. Pune is known as a popular metropolitan, which offers properties at affordable prices. It it has maintained a position of being in top place for mid income buyers of India. In addition to pocket friendly luxury segment options, the scope for infrastructure development like extension of Pune metro is also attracting the sale of property. . Along with that several proposed infrastructural developments have enhanced the positive sentiments for Pune real estate market. What is the project location?The project is located at Satav Nagar, Pune. What apartment sizes are available in Dreams Elina? The project offers apartments sized between 755.0 sqft and 1511.0 sqft. What is total area of 1 bhk in Dreams Elina? 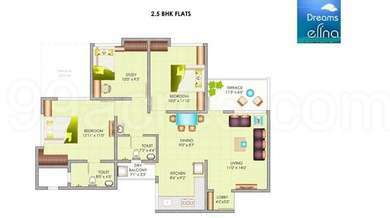 1 BHK unit in the project are available in an area of 800.0 sqft. What is total area of 2 bhk in Dreams Elina? The area of 2BHK units in the project varies from 755.0 sqft to 1192.0 sqft. What is the 3 bedroom size in Dreams Elina? The area of 3BHK units in the project varies from 1385.0 sqft to 1511.0 sqft. How much is the total size of Dreams Elina?The project is spread over an area of 7.0 Acres.